The NITRO® ZV19 Sport Pro gives you a host of the most popular high-performance upgrade options at an incredible value—you save $1,435 off the normal upgrade price! 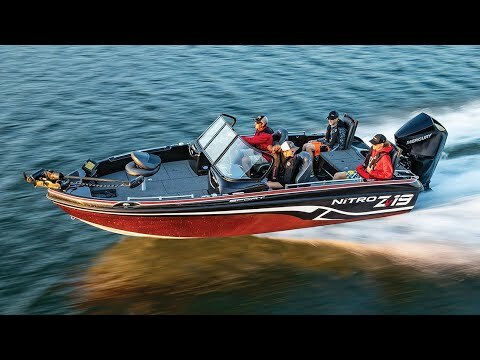 The NITRO® ZV19 Sport Pro comes standard with a Bimini top, dual jump seats, a ski tow pylon and the deep, comfortable interior keeps diehard anglers secure in rough weather and families safe when cruising. The aggressive Deep V hull slices through the chop on big lakes with smooth agility, and its wide beam provides plenty of stability for six. It also sports a raft of fishing features that will please the pike, muskie, bass, or walleye angler, and ample storage throughout that holds all the gear you need. Max. person, motor & gear weight: 2000 lbs. Average dry weight: 2300 lbs. Average package weight: 4500 lbs.